Warriors, Come Out to Plaaaaayyyyyyy! Warriors vs Rockets. Harden vs Curry. Steel cage death match. Winner gets LeBron. Man, I can totally dig it. There are so many factors at play! Let’s take a look at what each team needs to do to win, and what exactly is on the line for each franchise. 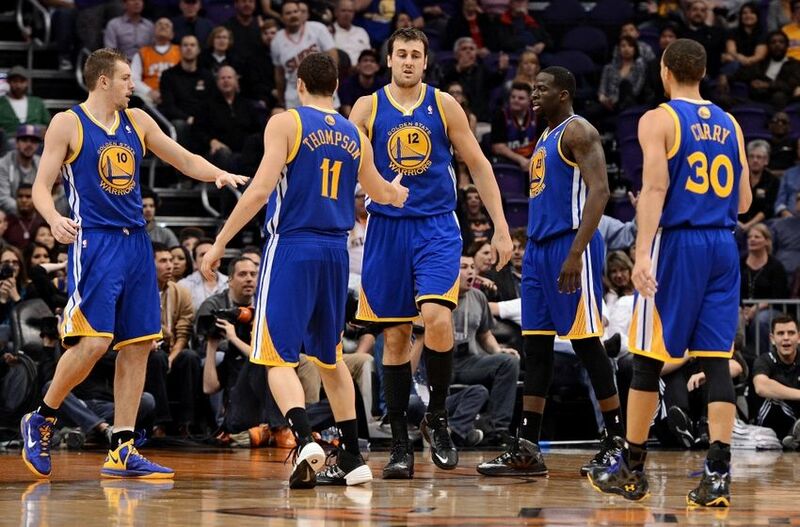 Golden State could be on the verge of something special. After putting together one of the most impressive regular season resumes in NBA history- bar none- they stand on the precipice of greatness. They swept Anthony Davis and the Pelicans and stood up to the physicality of the Memphis Grizzlies. They’re for real. But no truly great team ever went home without the Finals trophy in hand and the Warriors are heavy, heavy favourites as this series gets underway. According to ESPN.com, via the Elias Sports Bureau, they beat the Rockets each time they played this season, by an average of 15.3 points per game, which is the greatest disparity in Conference Finals opponents ever. How do the Warriors win? Well hell, they just need to be themselves. What’s more important here is why right now is the time they need to win. This Warriors team is incredibly deep. A 67 win regular season puts them in elite company. They have Andre Iguodala and David Lee- making a combined 27.3 million dollars- coming off the bench. Both are signed beyond this season but another key piece in Draymond Green, is not. If the Warriors want to retain Green and stay under the tax, it seems likely they’ll have to move one of the two in off-season. Lee would be the ideal candidate here but Iguodala definitely has more value. The bottom line is that it’s unlikely all three of those players return next season. That, combined with Andrew Bogut’s ever-questionable health means that the window for the Warriors is now. For those that think this is crazy: history is riddled with exciting young teams that everyone thought would be back in the Finals year after year. The 80’s Rockets, the early and late 90’s Blazers, the 90’s Pacers. The early 2000’s Kings never even made the Finals. Neither did the 7-seconds-or-less Suns. The Thunder lost to the Heat four years ago now, and they haven’t been back to a Finals since. Windows are fleeting. The Warriors need to strike now. This Houston team is not the same one that the Warriors repeatedly punked during the regular season. Their starting five now features the ancient Jason Terry and the resurgent Josh Smith. It also features a fully healthy Dwight Howard for the first time in a long time. Howard played in just 2 of the 4 match-ups between the teams this year and his presence will be key to Houston having any chance to topple their mighty opponent. So can Houston win? Well if you’d asked me a week ago if they could beat the Clippers, I’d have told you no. I’d have said the Rockets transition defense was too sloppy, that they had too many gamblers on both ends of the floor and that James Harden looked worn out after carrying this team on his back for six months. And then the Rockets came back from being down 3-1 and shocked the NBA universe. There’s nothing in the world like an underdog with momentum. But the Warriors are not the Clippers. They’re a more talented, deeper and much better coached outfit. So what can Houston do to upset them? They’re going to need to get physical. And they’re going to need Dwight to go off. In a world where the Rockets win, Harden and Curry will need to play each other to at least a draw. It might be different game to game but for the series, they need to be even at minimum. Corey Brewer and Trevor Ariza are going to need to do everything they can to guard Klay Thompson and Curry on defense, because Jason Terry is going to get eaten alive by the Splash Brothers. Josh Smith and Terrence Jones have given the Rockets nice spacing on the offensive end and anything they can do to draw Draymond Green’s active hands out of the paint will be a positive. If all of these things go right, it will create one on one match-ups down low between Dwight Howard and the leagues best defensive centre, Andrew Bogut. If Howard can harness the pure physicality that makes him such a special talent and have a couple of big games, then Houston has a chance. Beyond allowing Houston General Manger Daryl Morey to bask in his Dork Elvis-ness, Houston winning wouldn’t mean a lot to the league, outside of Rockets fans. Even though Houston wound up as the 2 seed, they’re definitely seen as a ‘lesser’ Western Conference opponent, nowhere near the league of the Warriors, Spurs or even the Clippers, who they just beat. Most fans are geared up for a Cavs-Warriors Finals that would surely be great. Houston needs absolutely everything to go right to have a chance at upsetting the apple cart, and therein lies the problem. In the two games in which Dwight played against the Warriors this season, there was a tale of two defenses: In one game, Howard was exceptional but Klay Thompson shut down Harden. In the other game, Harden went off, but Howard got into foul trouble and played just 24 minutes. 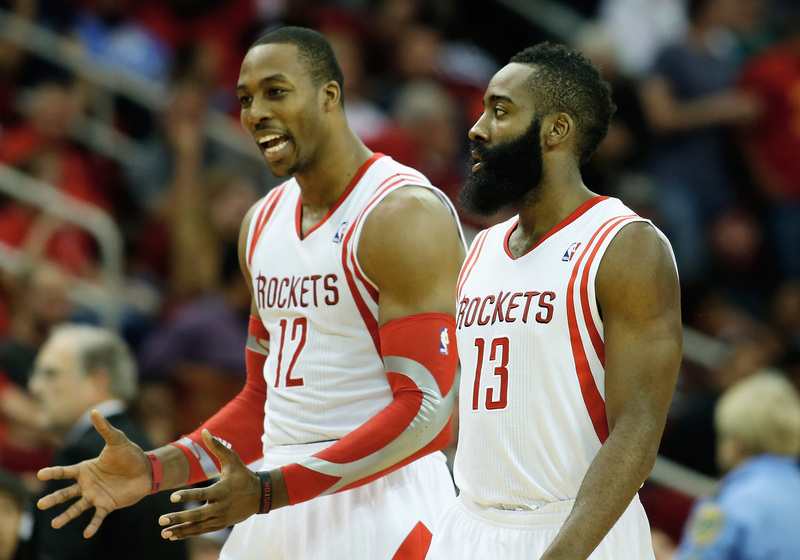 The Rockets need them both at the top of their game, because they’re not nearly as deep a team. Houston is much more banged up than the Warriors, missing bulldog point guard Patrick Beverley and stretch four Donatas Montiejunas, likely for the rest of the season, which really limits their ability to defend and stretch out opponents. But this degree of difficulty is nothing new for the 2014-15 Rockets; Houston has been doing this all year, on the back of the Beard himself, James Harden. If Houston wins, assuming Harden plays a central role, this will be vindication for all those people who voted for Harden over Curry as league MVP. ESPN has a stat circulating about past MVP vs runner-up matchups. LeBron bested Durant in the 2011 Finals and then you have to go all the way back to the late 90’s, when Michael Jordan topped Karl Malone twice in a row- once as the runner-up and once as the MVP. Few things stick in the minds of fans more than a slighted MVP raising his game to destroy the player who stole his award. Jordan over Malone in 1997 is a great example but there’s another that hits closer to home for Rockets fans. If Houston is going to win, they need Harden to channel 1995 Hakeem. They’re going to need him to show off the swagger that made him the best player in the NBA for much of this season. They’re going to need him to rattle the bottles and shriek: WARRIORS, COME OUT TO PLAAAAAAY! ← The New Sheriff: Can Mike Babcock Save The Leafs?